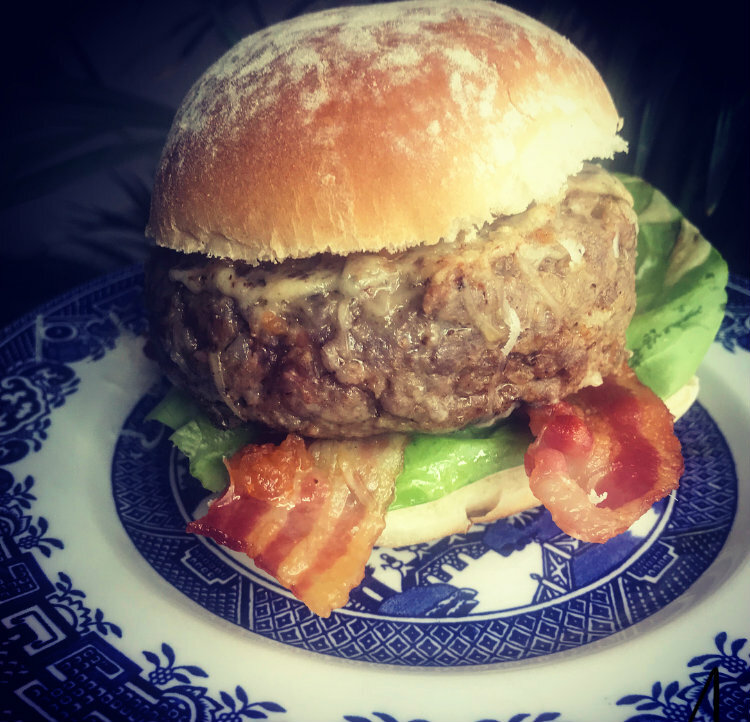 This is such a quick, easy and tasty burger with that added kick of spice from the CHAM CHAM Hot Pepper Sauce, that you can either fry in a pan or whack on the barbecue – you’ll be making them all summer, I hope! Using a cast iron plate on the cooker works just as well as barbecuing the burgers, you just get less of a charred, smoky flavour. Put the barbecue, frying pan or cast iron plate onto heat (obviously the barbecue will take a little longer to heat up, especially if you are using charcoal). Place all the ingredients, bar the oil, in a bowl and mix together well. Divide mixture into two, roll in a ball and flatten in the palm of your hand to about 1.5cm in height. Place on the heat and cook for 7 minutes each side if you are wanting it well done, 5 minutes if you are wanting it medium and about 3 – 3½ minutes if you are wanting it rare. Cook bacon under the grill at the same time, or place on the barbecue to cook. Toast your bun under the grill. Once the burger is cooked, top with cheese and place under the grill for 20 seconds to melt. Build your burger with some lettuce, the bacon and the burger on top. Finally add some more CHAM CHAM Hot Pepper Sauce on top of the burger to round it all off! Had the original hot pepper sauce with Parma ham, melon and cheese. Delicious!